Tessa Longbons | April 4, 2019. 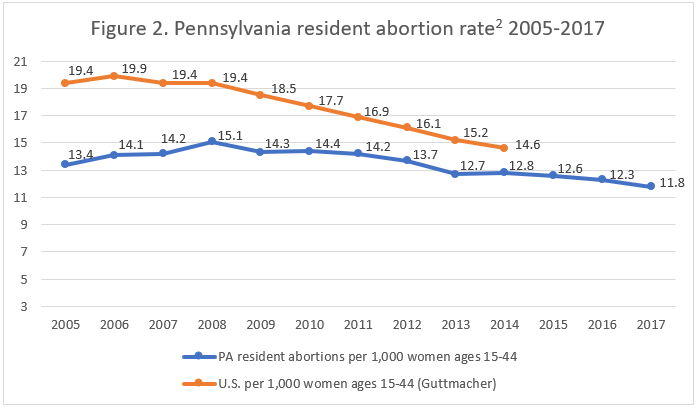 Pennsylvania’s abortion report for 2017 shows that total abortions are continuing to trend downward, while chemical abortions are rising. *Information on Planned Parenthood’s Pennsylvania market share is not publicly available. Total reported abortions in Pennsylvania fell by almost three percent between 2016 and 2017, while chemical abortions experienced little change over the same time period. There were 30,011 abortions reported in the state in 2017, of which 11,496 (38 percent) were chemical abortions. Pennsylvania has been reporting abortion data since 1975. Over the 42 years between 1975 and 2017, abortions in Pennsylvania declined by almost 31 percent. Since 1980, when a record 65,777 abortions were reported in Pennsylvania, abortions have fallen by 54 percent. 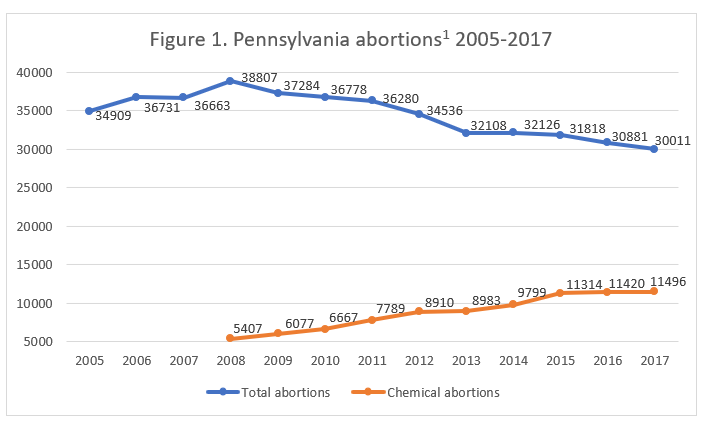 Chemical abortions in Pennsylvania have been steadily increasing over the past decade of reporting: between 2008 and 2017, chemical abortions increased by 113 percent. Pennsylvania’s resident abortion rate dropped from 12.3 abortions per 1,000 resident women in 2016 to 11.8 in 2017. A large majority of the abortions reported in 2017, 94 percent, were performed on Pennsylvania residents. Two percent of the abortions were performed on women from Delaware, and an additional one percent each were on women from Ohio, West Virginia, and New Jersey. The remainder were from Maryland, New York, and other unspecified states or territories, including one woman from another country. The majority of the women getting abortions were in their twenties (60 percent). Nine percent of the abortions were performed on females age 19 or younger, and 28 percent were on women in their thirties. Three percent of the abortions were performed on women age 40 or older. No single racial group represented more than half of the abortions reported in Pennsylvania in 2017. Forty-nine percent of the abortions were performed on white women and 43 percent on black women. Four percent were performed on Asian or Pacific Islander women and an additional four percent on women of other or multiple races. The Charlotte Lozier Institute estimates that Pennsylvania’s white abortion rate was 7.8 abortions per 1,000 white women between the ages of 15 and 44, while the black abortion rate was a whopping 36.6 abortions per 1,000 black women – more than four times the white rate. Most women (88 percent) were not married, while just 12 percent were married. Many women had previously given birth. Twenty-six percent reported one previous live birth and 35 percent reported two or more; 39 percent had no previous live births. Not quite half of the abortions reported in Pennsylvania were performed on women who had already had abortions in the past. Twenty-six percent of the women had one prior abortion and 21 percent had more than one, while 53 percent reported zero previous abortions. Sixty-two percent of the abortions reported in Pennsylvania occurred at eight weeks of gestation or earlier. Seventeen percent were performed between nine and 10 weeks, and eight percent occurred between 11 and 12 weeks of gestation. Five percent of the abortions were performed between 13 and 14 weeks of gestation, and four percent were performed between 15 and 17 weeks. Two percent occurred between 18 and 20 weeks of gestation, and one percent – 436 abortions – were performed between 21 and 23 weeks, more than five months of pregnancy. No abortions were reported after 24 weeks of gestation. In Pennsylvania, abortions are prohibited after 24 weeks unless the mother’s life or a major bodily function is at risk. In Pennsylvania, doctors who treat women for complications resulting from abortion are required to report the complications to the state health department. These complications are reported separately from the data collected on Pennsylvania’s abortion reporting form. During 2017, doctors reported 143 complications, compared to 155 the year before. Chemical abortions were responsible for 42 percent of reported complications in 2017 while making up 38 percent of total abortions. Twenty-nine percent of the complications were caused by suction curettage procedures, 16 percent by dilation and evacuation, and 12 percent by sharp curettage abortions. Two complications were caused by unknown abortion methods. Retained products, in which pieces of the baby or placenta are left in the mother’s uterus, were by far the most frequent complication, making up 71 percent of reported complications. Bleeding made up 15 percent of reported complications, while infection was seven percent and other, unspecified complications were six percent. Forty-seven percent of the instances of retained products were caused by chemical abortions. Abortions performed at later gestations were more likely to result in complications. Fifty-nine percent of the complications were caused by abortions performed at eight weeks of gestation or earlier, while abortions at this gestational age make up 62 percent of all abortions in Pennsylvania. Twenty-seven percent resulted from abortions performed between nine and 12 weeks, and eight percent were caused by abortions between 13 and 17 weeks of gestation. Two percent of the reported complications were caused by abortions performed between 18 and 20 weeks and three percent by abortions performed between 21 and 23 weeks, even though abortions performed between 18 and 23 weeks of gestation represent only three percent of all abortions reported in Pennsylvania. No girls under the age of 15 were reported to have suffered complications resulting from abortion. Three percent of the females experiencing complications were between the ages of 15 and 19, 60 percent were in their twenties, 32 percent were in their thirties, and three percent were age 40 or older. There were an additional seven complications that were identified and reported in the abortion clinic, as well as 255 women with pre-existing conditions that could complicate their pregnancies. Pennsylvania did not explain why there were 17 complications resulting from sharp curettage even though only one sharp curettage abortion was reported in 2017. Multiple complications of the same type were reported to result from sharp curettage abortions—for example, nine instances of retained products—suggesting that all 17 complications were not caused by just one sharp curettage abortion. There were just eight sharp curettage abortions reported in 2016, so it is unlikely that these complications were caused by abortions performed the previous year. It is possible that some women were treated in Pennsylvania for complications caused by abortions performed in other states. When CLI reached out for clarification, the state health department informed CLI that it does not attempt to reconcile the information reported by abortion clinics with the information reported by doctors who treat women for abortion complications. Pennsylvania tied for 23rd place in CLI’s 2016 survey of abortion reporting across the 50 states, the District of Columbia, and New York City. To improve its reporting, the Keystone State could include additional information on women’s reasons for abortion, particularly reasons for late-term abortions. Pennsylvania could also report on its informed consent process and the education levels of the women who choose abortion. As the home state of the notorious abortion doctor Kermit Gosnell, who went to prison for egregious violations including the murder of born-alive infants, Pennsylvania could report the number of abortions performed at each abortion center in the state. Still, abortion complication reporting is more detailed than that of many other states. Pennsylvania began reporting resident chemical abortions in 1998. The 2008 report is the earliest available online with both resident chemical abortion and total chemical abortion data. Rates taken from the Pennsylvania 2017 vital statistics report. Rates are calculated using the following formula: (Pennsylvania resident abortions ÷ Pennsylvania resident women ages 15-44) x 1,000.